This is one of those ‘if I can do it – you can do it’ projects. The most time consuming part of the project was finding my glue gun. That took approximately 2 hours. I so wish I were making this up. Christmas decorations are just up for a few weeks, so it’s important to be able to do something quickly in my opinion. 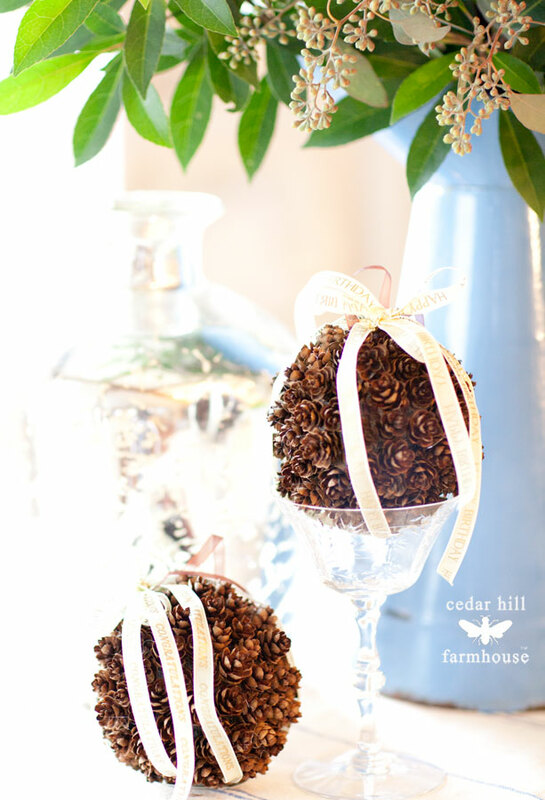 These pinecone balls are easy and quick to make and they can be used past the Christmas season. They will even keep from year to year. 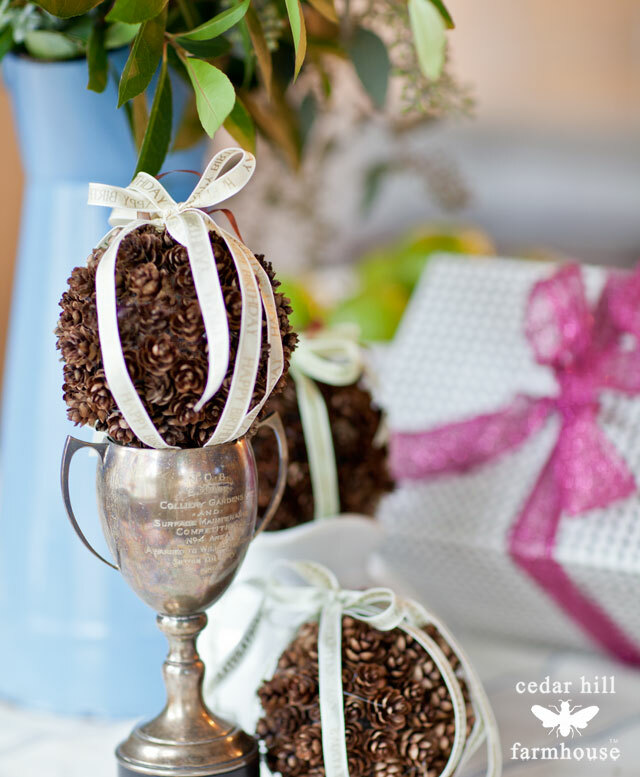 So how do you make one of these lovely potpourri balls? Now I don’t know where you get the mini pine cones. I picked them up off the ground in North Carolina. They are actually from a Hemlock tree. Technically they may be called ‘hemcones’ but I really don’t know. If these aren’t available I suppose you could use something else. First take the Styrofoam balls and spray paint them brown. This way the gaps in-between the cones won’t be so obvious. Next I attached a ribbon with the T pin to the ball. This ribbon will be used if you want to hang the ball. Then I started gluing the little cones to the balls. There were lots of glue bits that I had to pull off when I was finished. 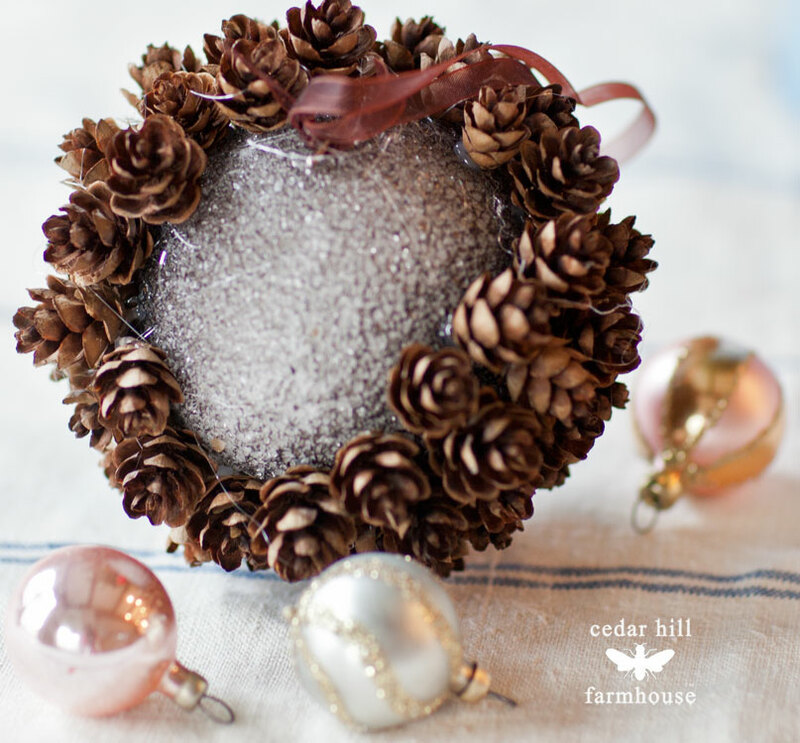 Add the little pinecones as close as you can together, and work your wall all around the ball. 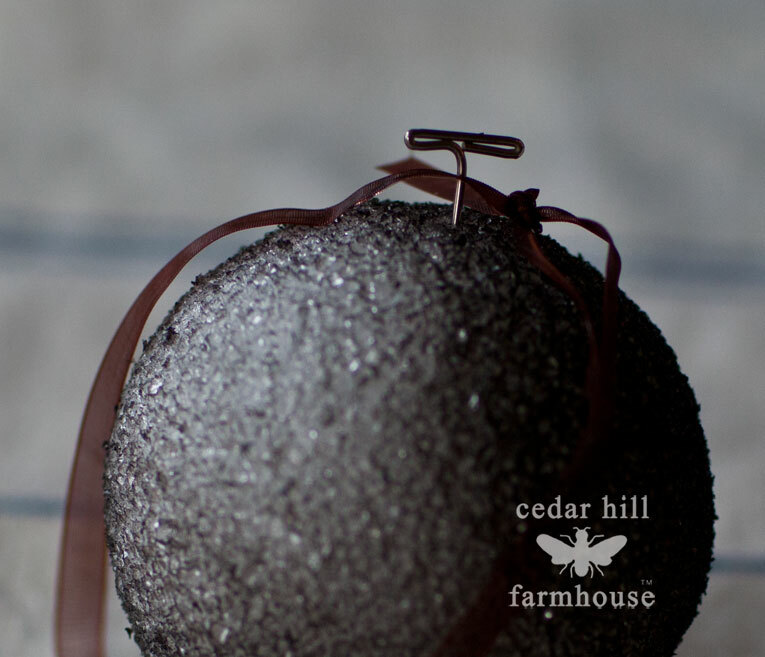 Once I completely covered the sytrofoam ball, I then wrapped the ball with the cream colored ribbon, and tied it in a bow on top. Now they are ready to be hung or you can just use them without hanging them by the ribbon. I just set them around my house. I hope you like them. I suppose you could add some scent to them, but I didn’t, because that would take more time, and you couldn’t smell it over your computer. I don’t like overpowering smells any way. This was a fun project, and I finally figured out what to do with all of those mini pine cones I have had since forever. Don’t feel bad. I have searched for days to find something and the whole time it was right under my nose. I have a few of those mini cones at my house. I will have to wait to go back to the north Georgia mountains to get some more. The balls are so cute! I love your ‘hemcone’ potpourri balls! I planted some hemlock on our property last year but it will probably be a few years before they form cones! Thanks for a lovely idea. Happy holidays! Those are such lovely trees Kimberly. Adorable! 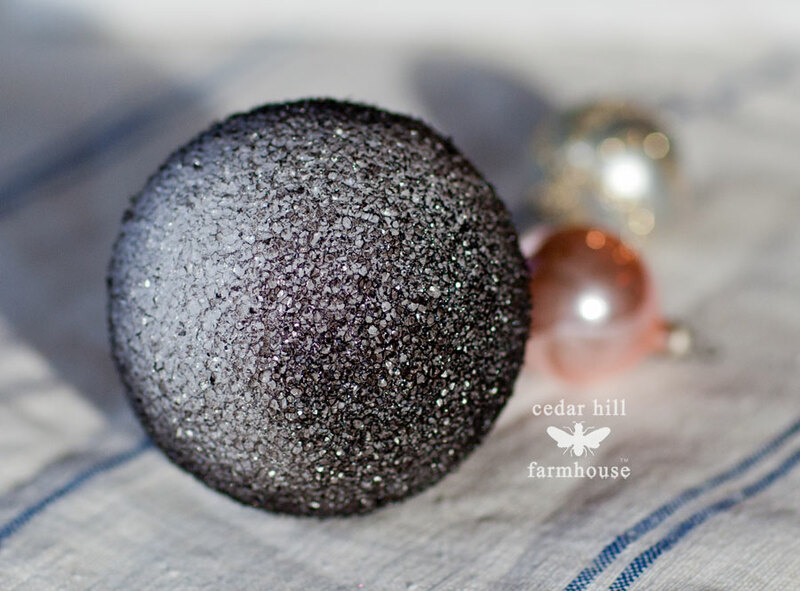 I have made balls sort of like this but with cloves stuck into oranges. Very cute! Wish I had some of those ‘hemcones’. You said you had to look for 2 hours for your glue gun? Well, I had a friend that never could find her glue gun when she needed it so she would go buy a new one. When she finally got around to cleaning her garage she found she had FOURTEEN glue guns! ’nuff’ said.